The fortunes of my books among British readers has always felt complicated by my ambivalent relationship with the United Kingdom. I love the high English liberal culture of my parents and my education, but I never fully connected to England itself. Perhaps this was because I spent the first decade of my life in South Africa, and the three decades since leaving Oxford University in the Middle East and Turkey. On top of that, my former wife was Swiss, my present wife is Dutch, my daughters went to French and German schools, and I have almost always preferred the rigour and vigour of working for Americans. My lack of a true anchor in Britain may be why my first two books seemed to do better in U.S. and international markets than in England. 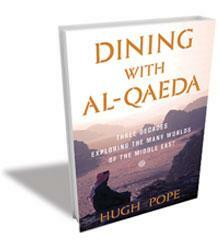 So it may prove for Dining with al-Qaeda as well. High-octane UK publications like the Economist and Prospect Magazine have reviewed it (here) and excerpted it (here), but the book is not yet formally published in Britain. Independent stores like Daunt Books and the London Review Book Shop display and stock the US edition published in March, as does amazon.co.uk, but if asked about it, mainstream bookstores scratch their heads or announce that it has been ‘sold out’. Nevertheless, I couldn’t resist when invitations arrived to give public talks about the book in May in three English venues: the first a presentation of the themes of the book to a dozen friends of International Crisis Group over dinner in London, and then talks in Cambridge and Oxford. I was met at Cambridge station by Ata Akiner, president of the university’s Turkish Society and the prime mover in inviting me to speak. 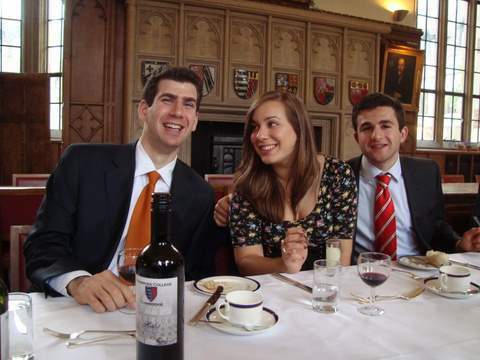 We first headed to Magdalene College, where I was greatly looking forward to staying. If my life had taken a different turn, I would have become the fourth generation in my family to be a student there; but, bruised by high 1970s drop-out rates in Oriental Studies, and probably wary of my rebellious school record, the college had dismissed my application to study Persian. Akiner and the Turkish Society proved the perfect hosts, setting me up in a delightful senior fellow’s room overlooking a leafy courtyard on a sunny afternoon that was flattering every corner of Cambridge’s lawns, gardens and lilac-garlanded stone walls. 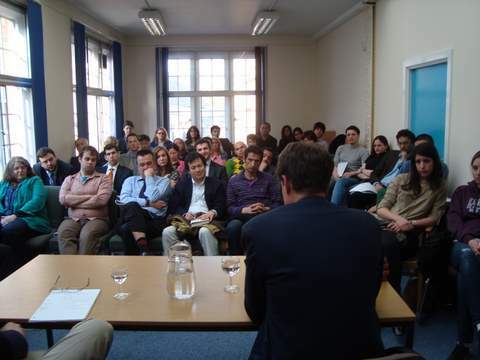 We then gathered followers to my talk in the Department of Politics and International Studies, and it became clear that Cambridge now helps prove a paradox: its collection of ethnically Turkish students from Belgium, Germany and England were another example of how the Turks of Europe can sometimes appear more cosmopolitan and borderlessly ‘European’ than Europeans themselves. They were also efficient in broadcasting news of the talk and directing people to the lecture hall through a departmental labyrinth. Even at this time of finals exams and gorgeous weather, they also defeated elite institutional ennui and filled every seat in the room. Dr. Geoffrey Edwards, the Reader in European Studies who introduced my talk, then spoiled me and the Turkish Society with a formal dinner in the hall of Pembroke College, replete with gongs, academics in flowing gowns, Latin graces, long silver-decked tables and a gorgeous light flowing in from windows opening out onto the honey-coloured quadrangles all around. Edwards turned out to be following the same lonely path as I do in trying to draw attention to the benefits of EU integration, and Turkey’s role in that, and gave me new strength in my conviction that Europe needs more unity rather than less. Two days later I headed over to Oxford, where my invitation was of a different nature. 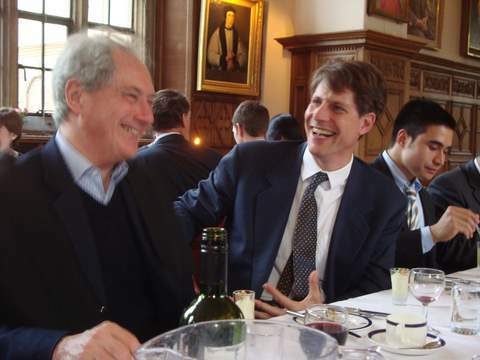 On being called up several months before to be asked if I would contribute cash to my old college, Wadham, I had said I had little money to spare but would be happy to give something in kind – a talk to the new generation of Oriental Studies students, perhaps. Within an hour my offer had been accepted. Wadham Arabic student and lead organizer Jessica Kelly filled a fine new room on the front quadrangle with an impressive number of students, and wrote up a pre-talk interview published in the student newspaper Cherwell (here). A lively barrage of questions ranged from my views on the film the Hurt Locker (more here) to a discussion of why, after I described International Crisis Group’s efforts to mobilize information behind policy recommendations, academics did not make the same effort to be currently relevant and accessible. Oxford was looking so beautiful that I happily lingered for two days more, punting on the river, lunching on a lawn near the Oriental Institute to chat with students about what post-Orientalists like us can expect from the world. I also took in a Balliol college lecture by Rory Stewart, an Etonian, Balliol man, army officer and diplomat, who, after writing successful books on his experiences in Afghanistan (The Places in Between) and Iraq (The Prince of the Marshes), has now stormed into the British parliament. By chance I sat exactly in front of him as he spoke, which doubled the impact of his words. He sports a well-trained memory, a clear rhetorical style, a confident strutting around and leaning on the lectern, a well-cut suit with a dashing extra waist pocket, and a political ambition that is only highlighted by his quotations from T.S. Eliot about the need for humility. I was soon convinced me that he has his sights firmly on Britain highest political office. Good for Rory Stewart. I found myself agreeing with all his arguments about the need for a far lighter footprint for troops in Afghanistan, and his account of the hypocrisy and irresponsibility that led to the build-up of troops there in the first place. Above all, I appreciated his attack on the great theoretical and academic infrastructure that continues to justify these self-defeating Western deployments, a mesmerising mixture, as he pointed out, of paranoia and megalomania. His comments about the UK’s predicament, and the misrepresentations of Middle Eastern reality that make it so hard to change policies, mirrored he arguments I make in Dining with al-Qaeda about U.S. policy and American media. I hope that in our different ways, people like us pushing together will in the end result in some better understanding of how to let the Middle East become a more constructive place.